Last Saturday, my bicycle was stolen from the foyer of my apartment building. Normally the bike was protected by a locked gate and a locked front door, but on that day the gate and the front door were left open for about 5 minutes while we waited for a painter to arrive to discuss the painting of our apartment. Some time between the gate being opened and the painter arriving, some lowlife walked in and stole my bike. Since we moved house recently and are currently in the middle of renovating, everything is in boxes and I have no idea which box contains information like the frame serial number. I have reported the theft to police, but without a serial number the chances of the lowlife thief being caught are close to zero. I do however still fantasize about finding the culprit and breaking their legs. 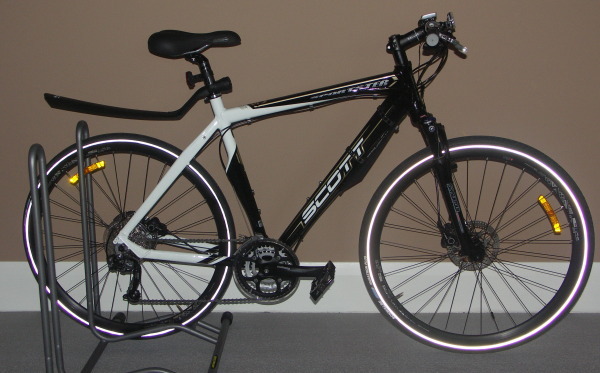 I now have a new bike; a Scott P2 Sportster city bike, a slightly more up market version of the Scott P4 that was stolen. Schwable Marathon Plus tires, the toughest tires I've ever had. Its also quite a bit lighter than the old bike and is a real pleasure to ride. I now need to work on keeping it out of the hands of thieves. Sydney's Drivers Worst for Bike Rage. According to this article in the Sydney Morning Herald Sydney's drivers are the worst for bike rage; aggression show towards cyclists simply for being on the road. "Sydney has around 2000 kilometres of cycle facilities while London only has 550 kilometres,"
Obviously this sounds good until you realize that Sydney is 12,144 square kilometers in area while Greater London is only 1579 square kilometers. That means that Sydney has 164 meters of cycle lane per square kilometer while London has 348, almost double. Furthermore, most cycle lanes in Sydney are not just totally inadequate, but outright dangerous. This is Not a Cycle Lane. Throughout the center of Sydney there are cycle lanes marked like the ones here on Crown St, Woolloomooloo. The cycle lane itself is about a meter wide and the distance between the parked cars and the inside marker of the cycle lane is about 30cm. Also notice that there is traffic in the on coming lane. The problem with these cycle lanes is that they are potentially lethal for cyclists. The problem of course are the parked cars. If a single car contains a person who opens a driver's side door at the wrong time, that door will almost certainly block most of the cycle lane leaving any unlucky cyclist with a split second to either try to brake or swerve out into the car lane to avoid the car door. Obviously swerving into the car lane might put the cyclist in the path of cars or trucks which are probably even more dangerous than the open car door that the cyclist was trying to avoid. The only safe option for cyclists in conditions like these is to ride in the middle of the car lane, far from the parked cars. Here they will be clearly visible to vehicles behind them and also to traffic heading the other way. Cyclists need to lobby their local councils for the removal of these unsafe cycle lanes or replacement with lanes that are safe. On the way home from work today I came off my bike. I was coming down a hill when someone parked at the left hand side of the road decided to do a U turn across my path. As soon as I realised they were doing something stupid I slammed on my brakes. Because it was raining I was going slower than usual but I still didn't have much time to pull up without sliding the bike sideways. Unfortunately that didn't work as planned. The bike started sliding sideways, but then flipped me over onto my back and the bike flew through the air and over the top of me. That sounds like a pretty nasty fall, but I was lucky. My only injuries are a nasty bruise to my inside left thigh, another to my left buttock and a sore neck. I didn't loose any skin or blood. I was very fortunate to be wearing a backpack containing my laptop inside its own padded backpack. The backpack took most of the fall and the laptop is unharmed. I also wear a BMX helmet instead of the lighter more flimsy racing style helmet but in this case the helmet only came into contact with the road as I slumped into my final position. I stood up again within about 10 seconds of hitting the ground. I was pretty shaken, but well enough to go to my yoga class at 6:15 pm. Update 2007-02-23 07:59 : Since writing the above last night I realised that I have a couple more bruises, that the bike did not fly over the top of me, but that I did flip over it so that I landed between the bike and the car and finally that my laptop did sustain some damage; one corner is slightly smashed in.